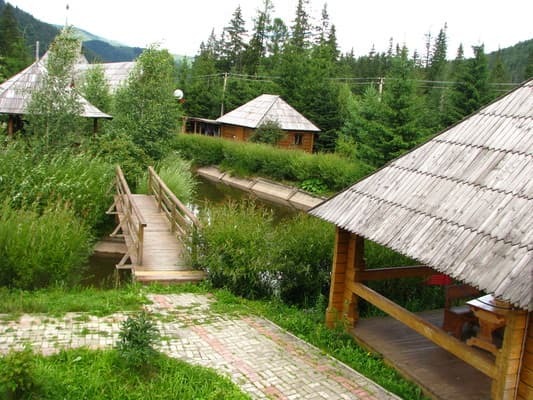 The hotel complex "Medved" is located in one of the most picturesque corners of the Carpathians - the village of Myslivka, which is located in the center of the Josefstal valley, near which the swift river Svicha continues. The valley itself is surrounded by century-old trees, clean mountain rivers, clear lakes, bubbling waterfalls, many springs with mineral water, magical green glades. 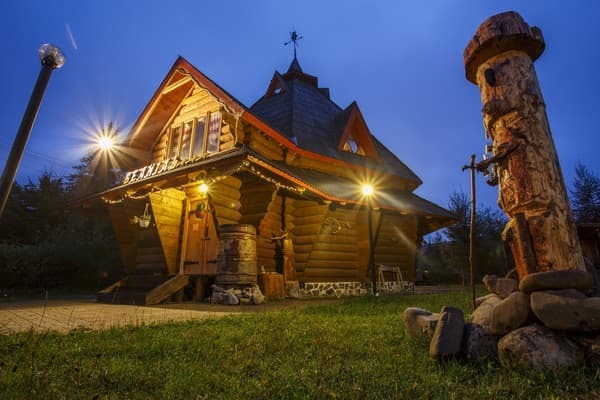 All the buildings of the hotel complex "Medved" are built of natural materials and are wooden log buildings. 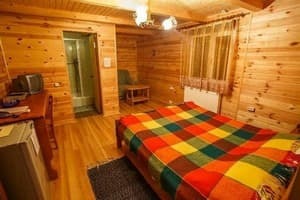 Description of the room: In every room - bathroom (WC, shower cubicle. Hot water - around the clock). 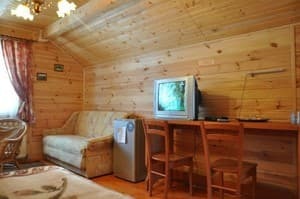 TV (20 channels of satellite and cable TV), telephone, mini-bar. 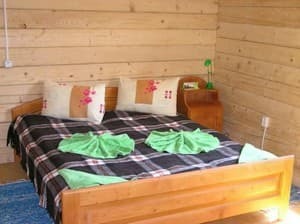 Description of the room: The cottage has 3 bedrooms, kitchen (stove, kettle, refrigerator, dishes), a living room and 3 bathrooms (2 bathrooms with shower and 1 with a bath). There can be 3 families for two or three people (for two adults and one child). 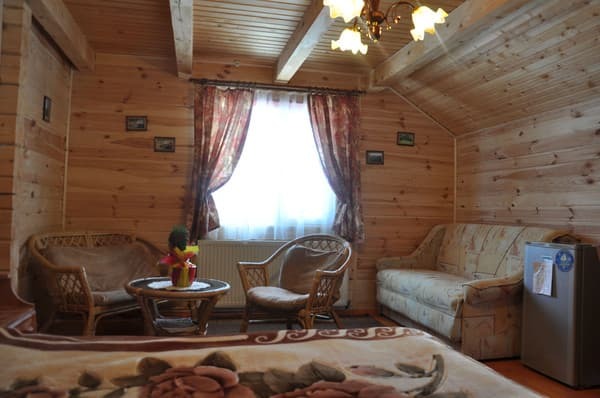 In each room: bedside tables, TV, telephone, mini-bar, bathroom (washbasin, toilet, shower, hot water - around the clock). Еда, интерьер, экстерьер, вид из окна, персонал на украинском языке, близко от трассы, есть транспорт, маршрутки, быстрое поселение, вежливость и профессионализм, положительность. Дуже гарні, краєвиди, котедж окремий від готелю. Children under 3 years stay free of charge without a seat. Our restaurant is a kolyba - traditional Ukrainian cuisine with a local flavor. Ecologically clean products, water - from a mountain spring. Collected in the mountains, herbal tea, Carpathian jam, mushroom soup, shish kebabs, any vareniki. Banquets made to order, dietary and baby food - on request. The village of Myslivka, which is located in the center of the Josefstal valley, near which flows the river Svicha. The distance to the district center of the Valley is 29 km (Dolina-Khust route). Entrance to the hotel is an asphalt road, 100 m from the road. The nearest railway station is Stryi (60 km). The nearest airports: Ivano-Frankivsk - 88 km, to Lviv - 135 km. On the territory of the hotel complex there are various health and therapeutic activities in the field of traditional and alternative medicine, feng shui, esoteric, spiritual practices, metal therapy, crystal therapy and other directions. By train: to the railway station st. "Stryi", railway station in Ivano-Frankivsk or in Lviv. From the railway stations by bus, minibus or taxi to the village. Myslivka (all transport passes through the city of Valley). It is possible to organize a transfer (taxi or minibus for 8, 18 and 54 seats). 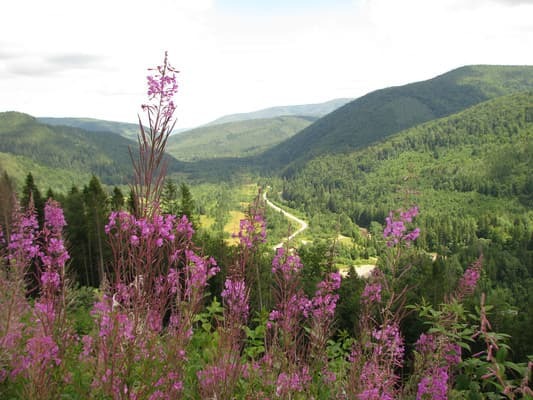 By car: take the highway "Valley - Khust". 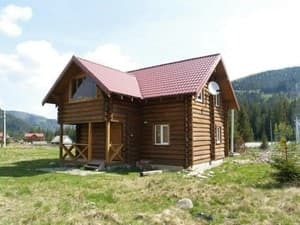 After 29 km from the Valley there will be a pointer to the hotel "Medved", at the sign turn left and drive 100 meters.